Kazuo Ishiguro is the author of six novels, including the international bestsellers The Remains of the Day (winner of the Booker Prize) and Never Let Me Go. He received an OBE for service to literature and the Chevalier de l’Ordre des Arts et des Lettres. He lives in London with his wife and daughter. CLICK HERE FOR MORE BOOKS BY KAZUO ISHIGURO. 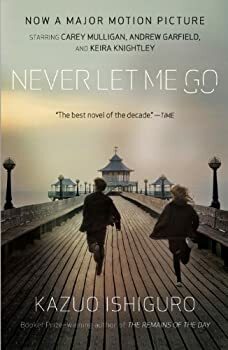 Kazuo Ishiguro’s Never Let Me Go is about clones, but don’t get your hopes up. This is an unconventional clone story. That’s right. There aren’t any mad scientists, nor are there any daring escapes. There isn’t even a sterile cloning facility run by a ruthless villain. So forget about a daring infiltration scene in which the sterile cloning facility is shut down from within. The Buried Giant: I Enjoyed It. Others Might Not. I enjoyed it. Others might not. I suppose I could put that title on a lot of my reviews without sacrificing much for accuracy, but I mean it to be suggestive here that The Buried Giant is going to be a bit divisive. It’s a well-crafted book, certainly, and it has as much thematic heft to keep anyone happy, but whether or not it’s an appealing book may be a bit less cut-and-dried.